Eye-catching in a form-fitting bright orange top, Lisa Pineiro made her entrance Thursday on CBS11's ratings-challenged early morning newscast. The single mother of four sons, who joined the D-FW station from Salt Lake City after five years as a stay-at-home mom, smiled broadly, giggled frequently and of course became an instant Texas Rangers fan. "Oh, it's just painful watching those highlights, isn't it?" Pineiro said shortly after the show's 4:30 a.m. open. The Rangers and previously impregnable starting pitcher Cliff Lee were pounded 11-7 by San Francisco Wednesday night in Game 1 of the World Series. Undeterred, Pineiro also let loose with a couple of "Go Rangers!" during the course of her first two-and-a-half-hour shift with incumbent Scott Sams. 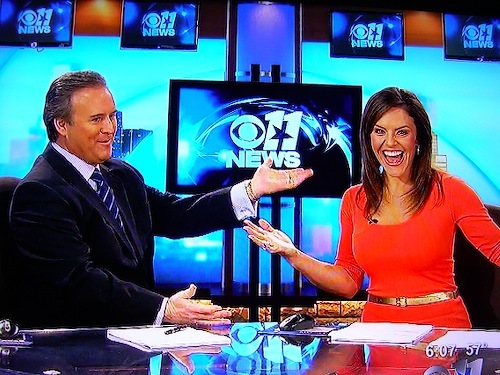 Sams, who has co-anchored CBS11's waker-upper since spring 2007, repeatedly welcomed Pineiro while twice introducing a taped segment of them cavorting together. Viewers also were treated to photos of Pineiro's four sons, Spencer, Mason, Hunter and Jack. Their age range is 11 to 17. "I talk about 'em non-stop. It's sort of annoying," Pineiro told Sams. Regardless, "I know the folks at home are going to love you," he assured her. CBS11 needs a lot more folks at home to watch. The station is still running fourth from 6 to 7 a.m., the peak viewership hour for D-FW's dawn patrols. But it's not as far behind as it used to be, and on Wednesday slid into second place (behind only Fox4) in the key news target audience of 25-to-54-year-olds. Pineiro made no major flubs on her opening morning, and even jabbed a bit at the oft-unpredictable Sams when he talked over her late in the 5 a.m. hour. "I'm trying to get to . . . " she told him, referring to weathercaster Garry Seith's update on the cool morning temperatures. "I'm sorry," Sams said good-naturedly. "I love it," said Seith. For her part, Pineiro professed "love" for former teen idol Shaun Cassidy, The Daily Show's Jon Stewart and country singer/hanger-on Billy Ray Cyrus, who's getting a divorce after 17 years of marriage. "I was all about that 'Achy Breaky Heart,' she said of Cyrus' mega-hit single. "I loved him." "Maybe you're a little excited he's getting divorced," appealingly frisky traffic reporter Teresa Frosini rejoined. "I didn't look at it that way -- but you're right," Pineiro said before giggling. "We're going to have so much fun. It's scary," Frosini assured Pineiro. It's easy to envision the two of them tearin' up the town, which wouldn't be a bad thing. But if you sight them in late night hours on Industrial Blvd., shoot me an email. CBS11 is continuing its live early morning cut-ins with KLUV radio personality and former CBS11 anchor Jody Dean, whose show also is simulcast from 7 to 9 a.m. weekdays on CBS11's sister station, TXA21. During the 6 a.m. hour, Dean played around with clips of CBS11's Melissa Newton encountering a seemingly inebriated man at a North Texas sports bar and anchor Tracy Kornet being pinched on her behind while doing a standup in San Francisco. Dean couldn't resist following up with a slice of stereotypical San Fran "humor." "The amazing thing is not that Tracy Kornet got pinched by a dude. It's that she got pinched by a dude in San Francisco," he riffed while CBS11's anchors groaned and quickly went on to something else. Sams also let it be known that he had made a bet with the Bay City's CBS station. They'll have to wear Cowboy hats and sing "Deep In the Heart of Texas" if the Rangers prevail over the facial hair-centric Giants. But if they lose, Sams and the morning team have to pay up by donning fake beards and warbling "I Left My Heart in San Francisco," he told Pineiro. And he was serious. That might be something of a youtube mega-event. So, um, go Rangers. But if the team falls short, there could be quite a post-game show the following morning.